San Francisco seems to be, among many other things, the city of the letterpress. There are likely as many small presses as caffe presses in town, most doing cards and many doing them memorably. At last fall’s Renegade Craft’s Fair, I bought a stack of yummy almost bespoke cards, including about 10 of these for obvious reasons. 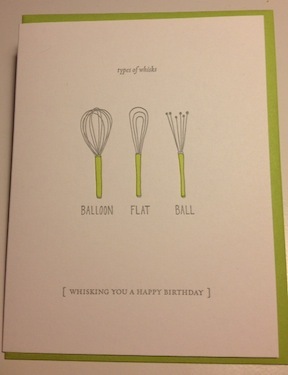 I later realized that the card should speak to the recipient and not the sender, and I don’t know all that many bakers…. At any rate, I share them with you in case you have bakers and other clever foodies in your life. 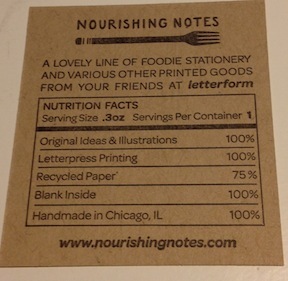 They are from Nourishing Notes which has an Etsy shop. In researching the details , I learned that this particular card is pressed in Chicago, not the Bay Area. In any new city, I ask for bakery recommendations. And then, perversely, avoid going to the place everyone is talking about. 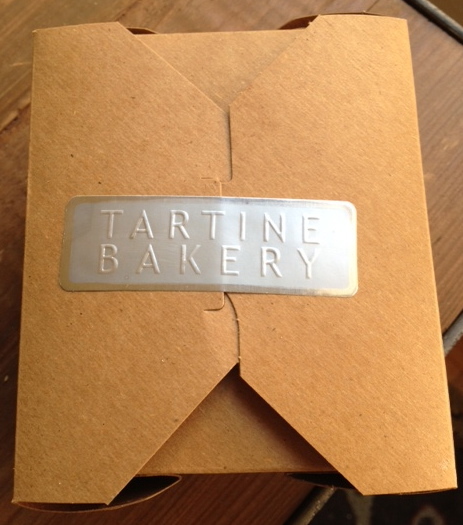 When I got to San Francisco, the first place anyone mentioned was Tartine Bakery. I put it on the top of my list and finally, over a year after I did, I went. Like so many places in big high-rent cities, Tartine is small. The line outside the door, at 3pm on a Saturday, was about 20 people (and was just as long when I left). It was so packed I ordered to go, without much time to review the full range or the atmos. 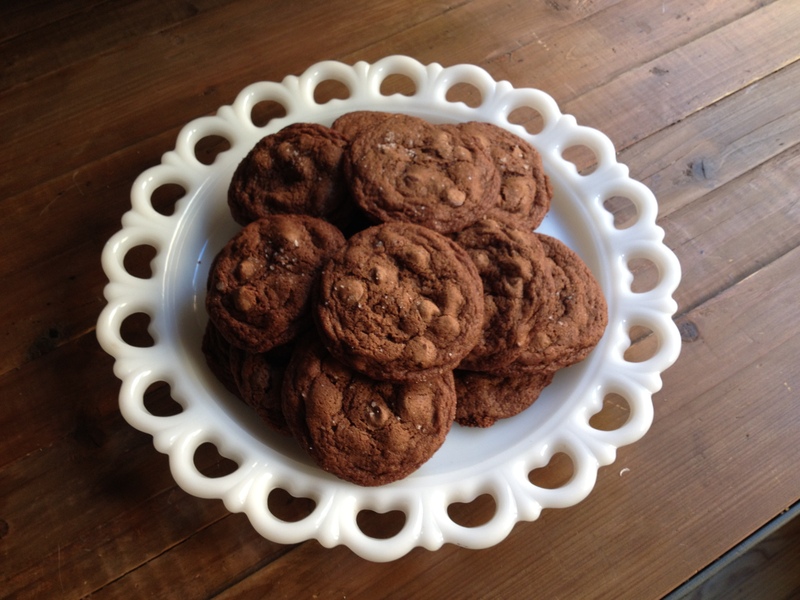 Chocolate Sea Salt Rye Cookie: The rye was just too intriguing, what would that sourness do with a cookie? Delicious. Dark with a few grains of sea salt on top. 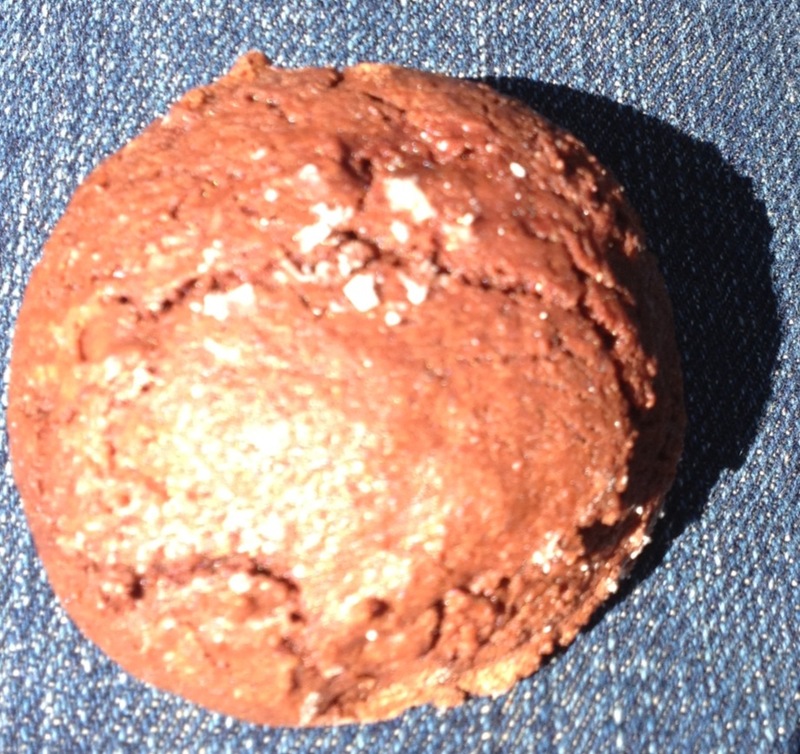 Texturally, similar to a macaron, with a bit of a crust and a super chewy inside. At first it’s all about the depth of the chocolate. Then the rye comes in and I can’t lie, it’s a surprise. And you do have a second where you think this may go wrong, but then it all smooths out and the rest is divine and gone too soon. Invokes dreams of a partnership with Blue Bottle Coffee Gelato (Gelateria Naia). 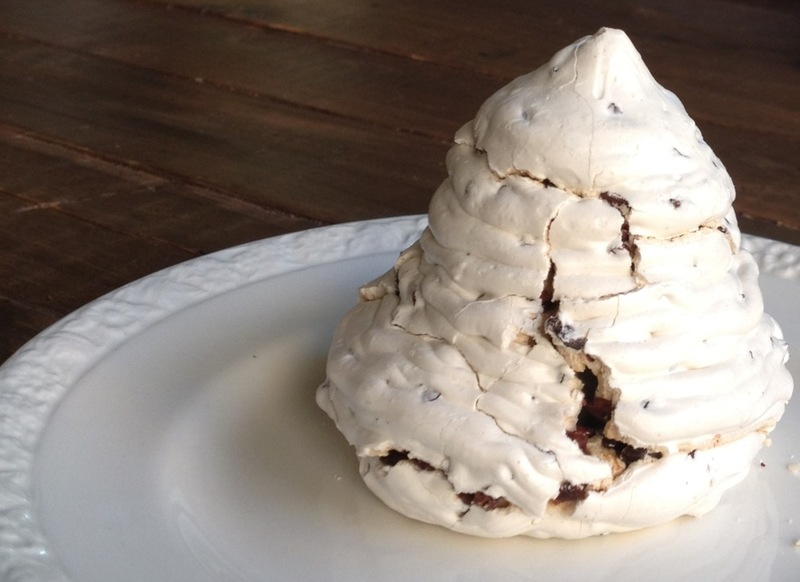 Cocoa Nib Rocher: Petite mountains of meringue speckled with cocoa nibs. Perfection. Not too sweet, exquisitely chewy, generous with the nibs. Did I say perfection? 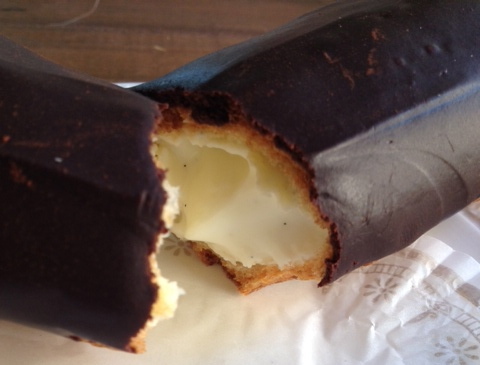 Eclair: Full disclosure — I’m a big eclair fan, but I’m all about the cream and usually don’t care for the glaze, so I tend to slice off the top and spoon out the cream (because let’s face it, pate a choux doesn’t hold up). Tartine’s eclair featured fresh pastry, the “glaze” is a thick layer of Valhrona ganache (a nice surprise and a bit of a treat). The filling is a light vanilla cream, very smooth. 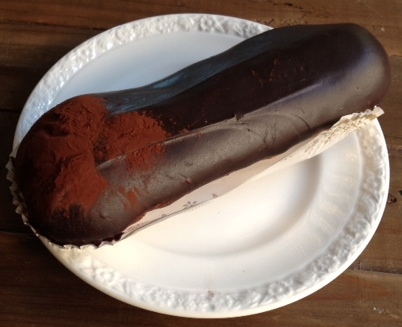 The caliber of the ingredients beg this eclair be eaten all together, in bites, not dissected. Only note: I prefer a custardy cream filling, Tartine’s has less body. 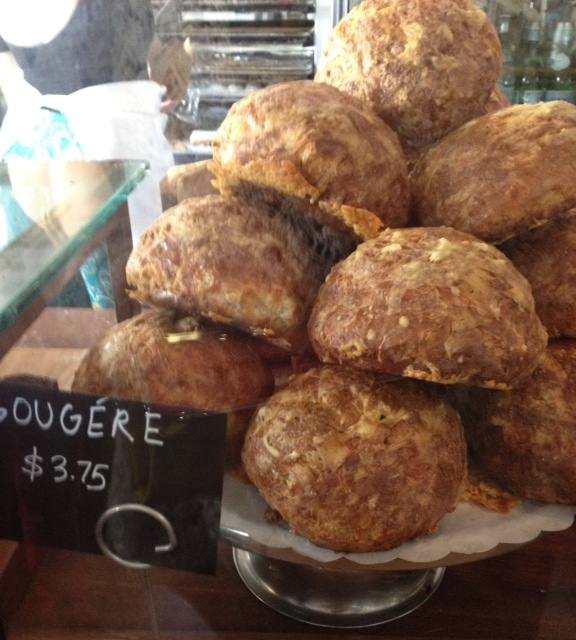 Gougere: I have eaten these choux and gruyere balls hot, bite-sized, with drinks. Tartine offers a softball-size version. Larger is not necessarily better so I balked, but in the end I had to. Pillowy, cheesy, chewy and pully, delicious even when sampled in the car. I think it would be improved when warmed up, but that’s a small complaint. It was seriously good, even without a cocktail. The revelation — Cocoa Nib Cream Tart: I’ve got a bit of a thing for cocoa nibs. 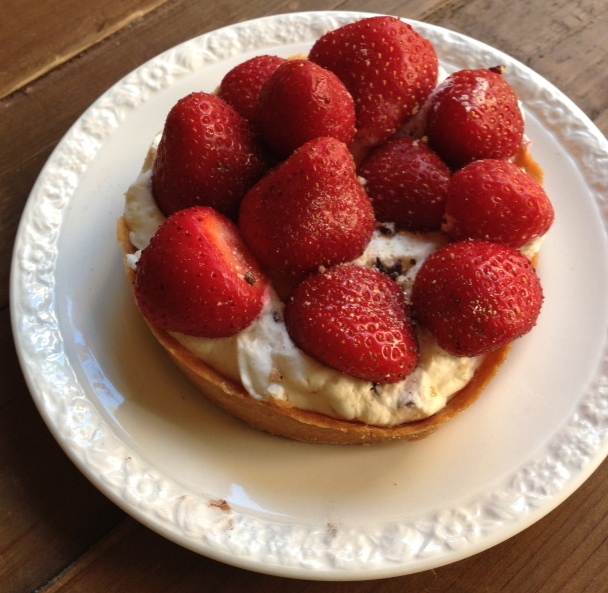 When I ordered the tart, I thought I was buying a lovely chocolate coated cake affair, but when I opened the box, it was a tart shell mounded with cream studded with nibs and covered with small, frais de bois-like strawberries. 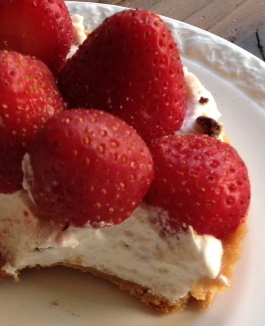 I appreciate fruit tarts but don’t gravitate to them. I was a bit disappointed. Until the first bite. More than whipped cream, but I don’t know why, full-bodied; tart-sweet berries; and a pastry crust that was so buttery it was almost caramelly. I never eat more than a bite of anything I buy when cruising bakeries. I ate every bit of this. Slowly and with relish. Or at home: Tartine Bakery cookbook.